On May 25th, 2012, the world's first privately held company sent cargo to the International Space Station, thus launching the private exploration of space. Destination: Neptune portrays an optimistic vision of commercial space exploration in the next century. Players control an organisation with the resources and intent to explore, develop and colonise worlds beyond Earth. Organisations that practice careful planning and resource management - with a healthy dose of technology research - will succeed. 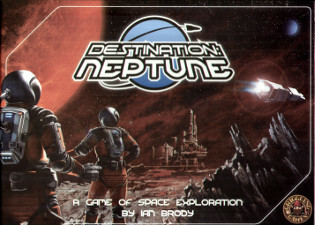 As Destination: Neptune moves through four generations of space exploration, players earn Victory Points by building bases, commercial facilities and colonies, as well as from fame and outright purchase. After four generations, the player with the most Victory Points wins the game. Destination: Neptune is the perfect game for both strategy gamers and anyone interested in exploring humanity's future in our solar system.